"The Island of Staffa is situated about eight miles from the coast of Mull, and six miles south-west from Ulva. Its surface is covered with rich verdure, and in summer it is pastured with sheep, but is not inhabited by man. It is nearly two miles in circumference, and is bounded by cliffs, whose greatest elevation is 144 feet. 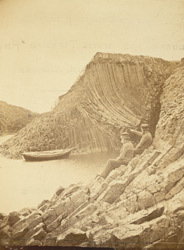 Sailing along the eastern coast of the island, the first cave approached is the Clam or Scallop-Shell Cave, on one side of which the columns appear bent like the ribs of a ship. On the other side, the broken ends of the columns bear a general resemblance to the surface of a honey-comb. The inside of this cave is thirty feet in height, eighteen in breadth at its entrance, and one hundred and thirty in length. The name of Clamshell Cave originated in the resemblance it is supposed to bear to a shell of that description. Proceeding over the causeway, on the left, is seen the Booshala or Heredsman's Isle. This pile of basaltic pillars is separated from the causeway by a narrow channel, through which a current of green and most transparent water rushes with startling impetuosity, dashing itself upon the rocks into foam and spray, which often glistens in the sunshine with the brilliant hues of the iris. It is, itself, a perfect gem in respect to its beauty of structure, being composed entirely of the most symmetrical forms, several of them bent in a perculiar manner, but the generality lying on their sides."